When it comes to choosing what type of lightbulbs to use, it’s important to know that LED lights are better than incandescents and fluorescents in pretty much every way. They are more energy-efficient, are more durable, and have a longer lifespan than incandescents and fluorescents. An important benefit that LEDs have for outdoor lighting is that they don’t run as hot as the other two kinds of bulbs. This means that they won’t damage delicate landscaping, and they aren’t as likely to catch your plants and home on fire. Here is a more detailed breakdown of the benefits of LEDs over incandescents and fluorescents. The style of your home has a large impact on your outdoor lighting choices. After all, you want your fixtures to complement your house. If your home’s exterior is beige or made of red brick, then brass, bronze, and copper fixtures will look nice with it. A slate, black, or gray home looks good with chrome, nickel, zinc, black, white, or pewter fixtures. This, of course, applies to fixtures that sit on or close to your house. If they’re on other parts of your property, it’s up to you whether or not you’re concerned about matching your home’s exterior. Where you place the lights is another determining factor of what kinds of light fixtures to use. To illuminate a front door, you’ll want large wall-mounted lights. Secondary doors should have medium-sized wall mounts, and back doors should have small wall mounts. If you want lights on your porch that are further from your door, ceiling mounts are a good option. And next to garage doors, go with medium-sized wall mounts. If you’re looking to show off your home’s exterior or plants at night, small uplights work best. Pathlights should be small fixtures that are low to the ground – your goal is to help people see the path without being blinded by the contrast between the darkness and lights that are too bright. For other locations on your lawn, post lights are the best option. Lighting a pool has its own set of options. Here is a guide on how to light your pool and pool area. And if you’re looking for security lights, you’ll want to review this in-depth guide on choosing security lighting. For help with choosing and installing outdoor lighting, contact Enhanced Outdoor Lighting & Design. 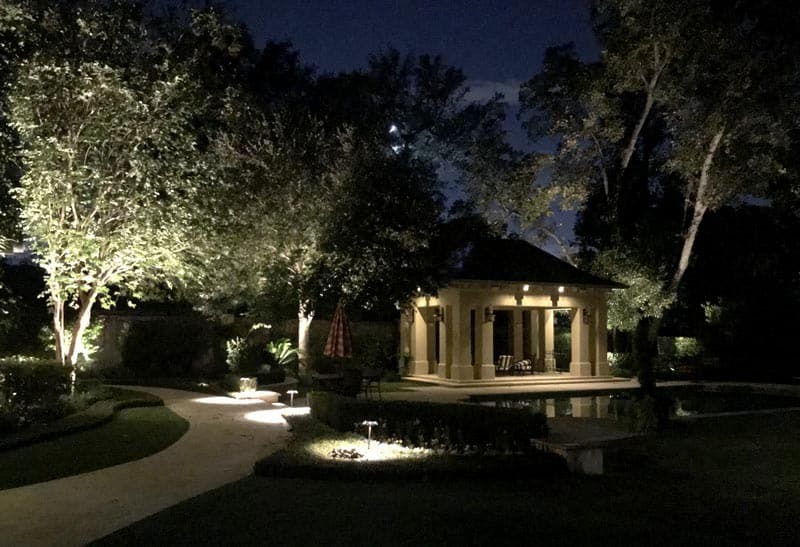 Their lighting experts will help you go through your lighting options, come up with a lighting design, and then install your lights so that they will work perfectly for years to come.